Collecting World War 2 propaganda posters is a hobby for many people. These posters were created by some of the most well known artists and commercial artists of the 1940s and are an artistic, as well as historic, record of an important part of world history. What is a Propaganda Poster? The posters were commissioned by various governments in both World War 1 and World War 2 to keep public morale and commitment to the war effort high. Nearly every country involved in the war had a version of the propaganda poster. Nearly every artist commissioned to produce a poster added his own artistic interpretation. Posters were placed in various locations to remind citizens to support the war effort. From barbershops to store windows people constantly viewed images that were created to inspire patriotism and pride in their home country while inciting wrath against the enemy. The images, colors, and wording used were specifically chosen to manipulate people's emotions and encourage intense response. Posters were not the only type of propaganda that the government used during World War 2 but they were the most eye-catching. Items for "The Boys over there"
There were many artists that created posters during the World Wars. They were often well known artists and illustrators of the time who were recruited by the newly created Office of Wartime Information, or OWI.Many of these names are familiar to us today. Northwest University Library has an online collection of about three hundred posters from World War 2. Nazi Propaganda posters are interesting to look at. It is easy to forget that propaganda was common in every country. The University of North Texas collection of World War 2 posters. 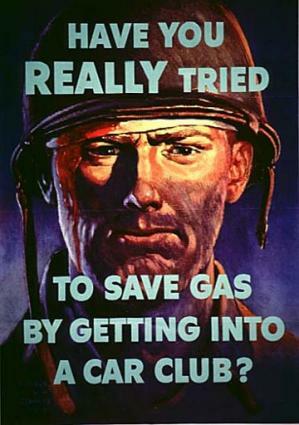 World War 2 posters, like other vintage posters, were never really meant to last a long time. They were printed on cheap paper and subjected to all kinds of weather conditions. Many have not survived. Yet it is still possible to find these fascinating bits of history once in awhile. Always check local antique stores and used book stores. Often books and magazines from that era will have a page of two of small propaganda posters in the publication. Antique auctions are another possible source.The Internet, however, is still the most predictable resource for vintage posters. Read carefully, while there are many online sources for reproductions not very many carry the original posters. Some places that do carry the original posters are"
In addition, collectors may find the book by Martinus, Norman and Harry Rinker. "Warman's Paper"(Wallace-Homestead Book Co., 1994) to be helpful in determining the values of the posters. When you are buying vintage posters remember that they are going to look old. Be careful of posters that look brand new. They may very well be reproductions. When shopping on the Internet, and especially eBay, you should ask a lot of questions. Ask the seller for more pictures until you are satisfied that you are getting what you want. Always ask for a Certificate of Authenticity if the seller does not offer it. Finally, be sure that you understand the seller's return policy so that if you didn't get what you thought you were getting you can send it back. Collecting World War 2 propaganda posters is an important way to preserve an important historic at form. Learn to enjoy the colors, emotions, and designs that the artists put into these amazing works of art..